Every year the Green City Market challenges Chicagoans to put their money (and their local food!) where their mouths are. From September 7 through September 21, dedicated market-goers can sign-up to take the Locavore Challenge and pledge to eat only local food, to the best of their ability, during those two weeks. During the Locavore Challenge, Green City Market supports their fearless locavores with variety of wonderful educational opportunities, social events and culinary inspirations. Those who sign the Locavore Pledge can pick up their "Locavore Kit" at the Market (Wednesdays and Saturdays). The "Locavore Kit" includes a schedule of events, locavore resources, and recipe ideas." Homemade Ice Cream with Kilgus milk and cream and Genesis eggs over Klug Fruit Compote. Prairie Fire’s Sarah Stegner, a founder of Green City Market, also is a judge for a culinary school pickling competition being held in conjunction with the Locavore Challenge on the 17th at the market. * Information Fair: Saturday, September 10 8 AM-12 PM featuring local food and sustainable agriculture resources from all around the region. * A Locavore Picnic Supper, Co-sponsored by the Peggy Notebaert Nature Museum, to celebrate our accomplished locavores, introduce them to each other and further the conversation about seasonality and sustainable food in the Midwest. September 21st at Peggy Notebaert Museum. Reservations are $30 per person. * Everyone who takes the Locavore Pledge will be entered in a Raffle to win a canning kit and a canning class for two from Glass Rooster. Sign-up for the Locavore Challenge today! You can take the pledge online or at the Green City Market Information Booth on Wednesdays and Saturdays from 7 am to 1 pm. Visit the Green City Market Blog for ideas, updates and stories from your fellow locavores. How often do you think about where your food comes from? 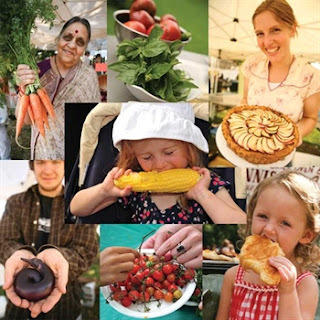 Now is the chance to pledge to eat locally from September 8-22. Green City Market offers the greatest variety of locally- and sustainably-grown products in the Midwest and we're here to help you jump right in! Pledge to eat all local, all the time...well, at least for two weeks in September. Sign up below and we'll send you the Green City Market Locavore Kit that includes valuable information on how to eat locally in Chicago and the best places to shop and dine for local food.